Please click on an image to download each book free - for a limited time only. An exciting adventure on the edge of reality …with a grave warning for humankind. 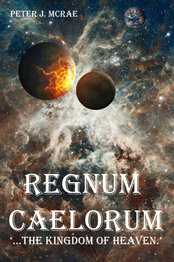 A story for our time, and purposefully poised between the worlds of reality and fiction the pages of Regnum Caelorum '...The Kingdom Of Heaven' take a teenage boy; his madcap, eccentric Grandfather and you on an epic adventure across time and space. For you, a voyage of discovery and wonder awaits as the astounding narrative of the controversial ‘Impact and Exit Event’ hypothesis is woven into almost all aspects of the story-line. This provides the backdrop to an amazing series of experiences, all of which are guaranteed to confront and question many of your innermost thoughts and beliefs. Furthermore, you’ll discover on almost every page that you are mischievously tempted to re-enter the world of reality to substantiate if each of the incredible revelations you are encountering are indeed transporting you into a world of fiction …or taking you an incredible voyage towards a new reality for you. If this isn’t excitement enough the array of characters you encounter throughout your journey also encourage you to delve deeper into your own subconscious mind. You will become embroiled in a series of sensational events which suggest an alternative history of the Solar System; a revised version of the geologic history of Earth and an astounding modification of the present-day understanding of how the human species developed many thousands of years ago. Finally, and unbelievably you’ll join Tim, his Grandfather and others as they deliver a dire warning for humanity. Although momentous, the significance of this warning is then dramatically surpassed by the unexpected intervention of a mysterious figure from the distant past who, by communicating an astonishing reality-check challenges humankind to face up to its collective mistakes. Dressed in a white, hooded robe this strangely familiar figure then offers a route to salvation for the people of Earth, and in doing so delivers a timely and gripping finale to your amazing adventure. Is this a work of fiction, fantasy or fact? The Impact and Exit Event hypothesis is a simple explanation of how a large section of today's Science is based upon flawed information and incorrect assumptions. Because of this, for the past two hundred years the very foundation upon which much of today's Science was developed has been seriously flawed. It is acknowledged that this is a major statement to make. However, it is also acknowledged that a statement such as this requires extraordinary supporting evidence. When reviewing the wealth of evidence presented within the pages of The Impact and Exit Event you will learn and more importantly see how the geology of Earth was formed in an instant; what Tectonic Plates really are; why some planets have ring systems (and why others do not); what created the 'scar on Mars'; how Earth's Moon was formed; why (and how) the Pacific and Atlantic Oceans emerged extremely rapidly; how these oceans saved our planet from complete destruction ...and much, much more. You will also see for yourself how it is that these apparently disparate events of devastation and rebirth are actually connected to each other via an amazing series of cataclysmic events. 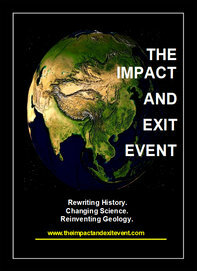 With over 230 pages, 100+ colour images, 50+ author sketches and numerous hyperlinks to external supporting information The Impact and Exit Event offers the reader a fully illustrated timeline of interlinked global catastrophes - a series of events that consequently created the varied geologic features that we see today across Earth. The central thrust of The Impact and Exit Event is to communicate to the reader a previously unrecognised series of enormous and interconnected catastrophic events. The scale and nature of the events uncovered suggests that research undertaken since the early 19th century in geology, astronomy, archaeology ~ and more ~ has progressed along an entirely erroneous course. Incredibly, once the key to an astounding series of events was discovered in the most unexpected of places, The Impact and Exit Event actually wrote itself. To his astonishment all that the author needed to do was to follow the trail that was set before him, time and time again. "This is an amazing, spot -on analysis..."
Throughout the pages of the book the author puts forward powerful visual evidence in support of his findings and, as most of the evidence contained within the book is based upon information obtained via the Internet he constantly encourages the reader to use the Internet to challenge, or better still corroborate his findings. Never before has a commentary such as this contained information that has ~ at a stroke ~ challenged so many currently accepted ‘realities’. Prepare to have all of your preconceptions about the history of our planet and our solar system uprooted by a bewildering array of irrefutable physical and visual evidence that the reader can, via the Internet witness personally, question and then debate with others. "...what you have discovered is absolutely incredible!" When reading The Impact and Exit Event you will quickly become aware that the content of these pages are taking you on an entirely unexpected journey, along an astonishingly easy-to-follow trail, which in turn leads you to an amazing series of world-first discoveries. The author confidently predicts that once you have discovered what lies within the pages of The Impact and Exit Event you will never view the Solar System ~ and especially our home planet ~ in the same way again. Hold on tight to your current belief systems because The Impact and Exit Event is about to infiltrate and significantly modify them!